Wirehaired Pointing Griffon (Korthals Griffon) Although dogs of the Griffon type have been described in literature for centuries, we owe the modern Wirehaired Pointing Griffon to Eduard Karel Korthals (1851-1896). Son of a wealthy ship outfitter in Amsterdam, he was, like his father, passionate about breeding. He abandoned the family business in 1873 with a modest pension to settle down with friends in Germany. 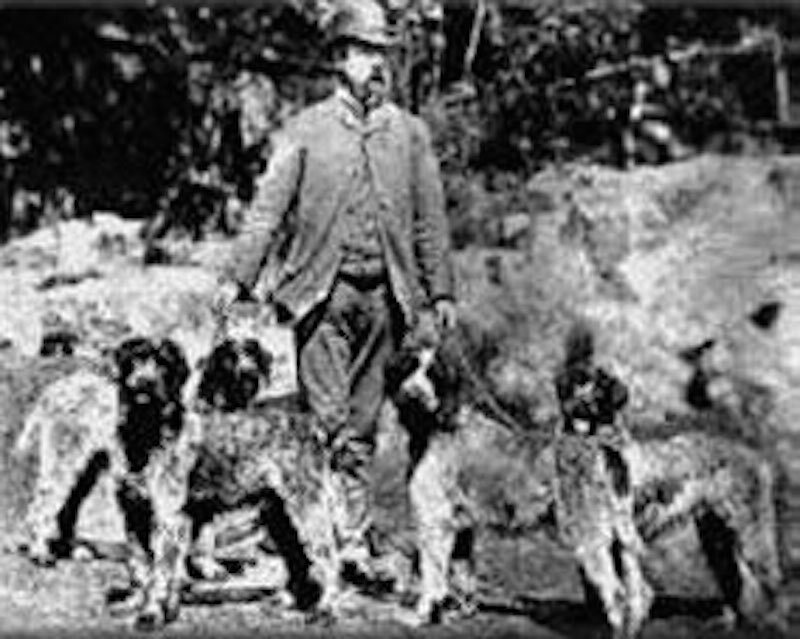 In 1877, Korthals became the kennel master for Prince Albrecht zu Solms-Braunfels and undertook a breeding program dedicated to the creation of the Wirehaired Pointing Griffon. Seven dogs made a particularly significant contribution to this breeding program and these came to be known as the foundation of the breed. They were the males Banco, Hector, Janus and Satan, and the females Donna, Juno and Mouche. An eighth, a female named Vesta, also contributed to the breeding program. Avoiding any infusion of British blood, Korthals used tight inbreeding. His selection criteria was strict; first, he removed the incorrect coat types. Next, he tested their capabilities on the field and finally, of these, he retained only those that reproduced well. Of 600 puppies, only 62 met Korthals expectations and could thus be registered in the stud book. Less than 10 years after he initiated his breeding program, he had succeeded in fixing the breed type of the Griffon. Twenty years later, the ideal specimen was realized. This was a great achievement in the world of dog breeding. A definitive standard was adopted on November 15th, 1887, at a meeting attended by 16 breeders, chaired by Prince Solms-Braunfels. The French club (still in existence today) was founded in 1901 and, on the occasion of its fiftieth anniversary in 1951, decided to pay tribute to Eduard K. Korthals by adding his name to the designation of the breed. 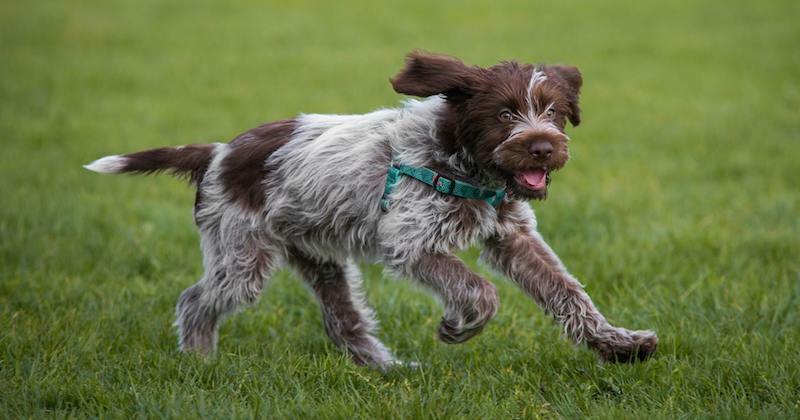 For that reason, The Wirehaired Pointing Griffon is often referred to as the Griffon Korthals, even in North America. 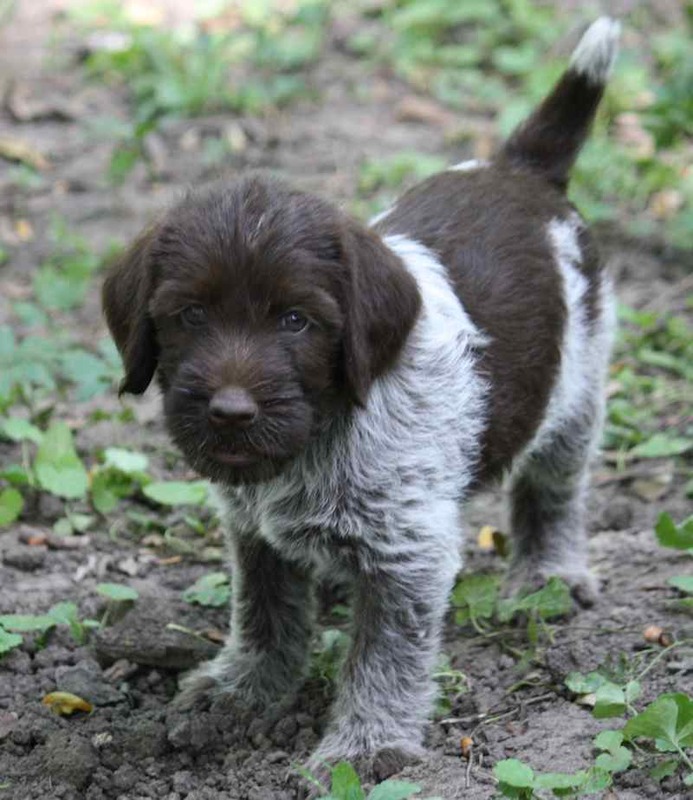 An ideal family companion, the Wirehaired Pointing Griffon is a versatile hunting dog, intelligent and easy to train. The Griffon is a rugged dog meant to work in a variety of terrains and climates. He is well adapted to hunting in marshes and swamps and has also been used in the search for larger wounded game. 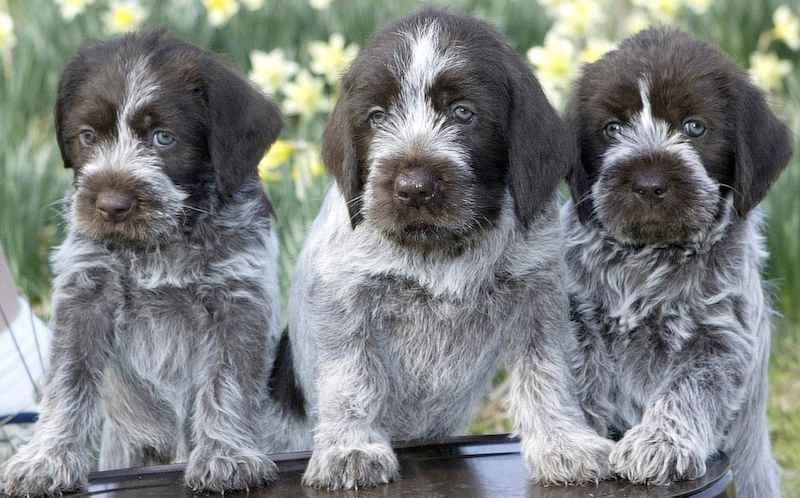 General Appearance: The Wirehaired Pointing Griffon (Korthals Griffon) is a dog of medium size. Longer than tall. He is strong limbed. Hardy, everything about him indicates strength and vigor. The bushy eyebrows and the prominent moustache and beard give the Korthals Griffon his characteristic expression conveying confidence and assurance. His coat is harsh like the bristles of a wild boar. 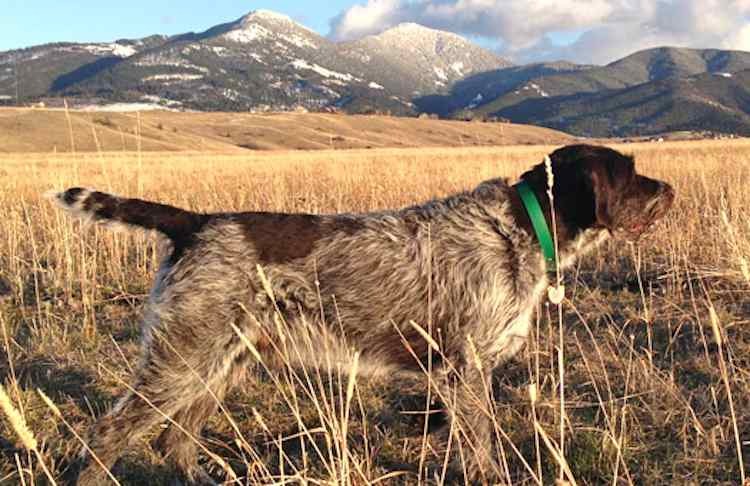 Wirehaired Pointing Griffon Temperament: Gentle and proud, an excellent hunter, intelligent and easy to train, the Korthals Griffon is very attached to his master and his territory which he guards with vigilance. He is very gentle with children and is loyal. Size Height: 55 -60cm (21 ½ – 23 ½ inches) for males, and 50 -55 cm (19 ½ – 21 ½ inches) for females. Plus 2 cm (3/4 inch) and less 1 cm (3/8 inch) is acceptable in males and females but not preferred. Coat and Colour Hair: hard and coarse reminiscent of the feel of a wild boar’s bristles. Never curly nor woolly. Under the harsh top coat is a downy, dense undercoat. Color: Preferably steel grey shade with brown (liver) markings usually liver brown or liver roan. Never black as any black colour in the coat is a disqualification. The absence of undercoat is a disqualification. A short coat is not acceptable except on the head where it may be trimmed ‘French style’ i.e., – shorter on the skull, ears and cheeks. The eyebrows and the moustache must be prominent. Head Large and long, covered with harsh hair that is thick but not too long; the moustache, beard and eyebrows must be prominent. Skull: Not too broad, not wider than long. The foreface is approximately the same width as the occipital area. The planes of the skull and muzzle are parallel. Stop: Not too pronounced. Nose: Always brown. Muzzle: Long and square, slightly convex at the tip, parallel and of equal length to the skull. Jaws and teeth: Strong, with a tight, properly aligned scissors bite, i.e., upper teeth closely overlapping lower teeth and Set Square to the jaw. Full dentition. Overshot or undershot are disqualifications. Missing teeth: more than 2 incisors, or more than 2PM1, more than 1 PM 2, PM3, PM4 or a missing molar are also a fault. Eyes: Amber (dark yellow) or brown, large, rounded, and surmounted by, but not covered by the eyebrows, conveying a very intelligent expression. Ectropion, entropion, wall-eyed, are disqualifications, light eyes is a fault. Ears: Of medium size, not curled inwards (i.e., not like a corkscrew), lying flat, set on level with the eyes and rounded. The hair covering should be short and mixed with longer strands. The length of the ear should reach midway along the muzzle. Neck: Moderately long and slightly convex, it must be powerful, without dewlap. Forequarters: Shoulders long and sloping. Forelegs very straight, muscular, furnished with thick wire hair. Body: Its length is markedly greater than the height at the withers from 1/20 to 1/10. The height is measured at the withers and the length is measured from the point of the shoulder to the point of the buttocks. The Griffon is more rectangular than not and never ‘cobby’. The tuck up is more filled out and must be in balance with the thorax area. The Griffon must not have a defined waist (not wasp-waisted). Back: Strong with powerful muscles, level topline except at the withers which are slightly higher to accommodate the neck. The loin is well developed. Chest: Deep, well developed, not too wide, ribs slightly sprung. Hindquarters: Hind legs well furnished with thick wire hair, the thighs are long and well muscled, the hock joints well angulated. Moderate bend of stifle. Feet: The feet are round, firm, the toes tight and well arched (cat feet). The nails are strong and pigmented (always black). Tail: Carried straight or gaily, furnished with a hard coat without plume, docked to two-thirds of its length. 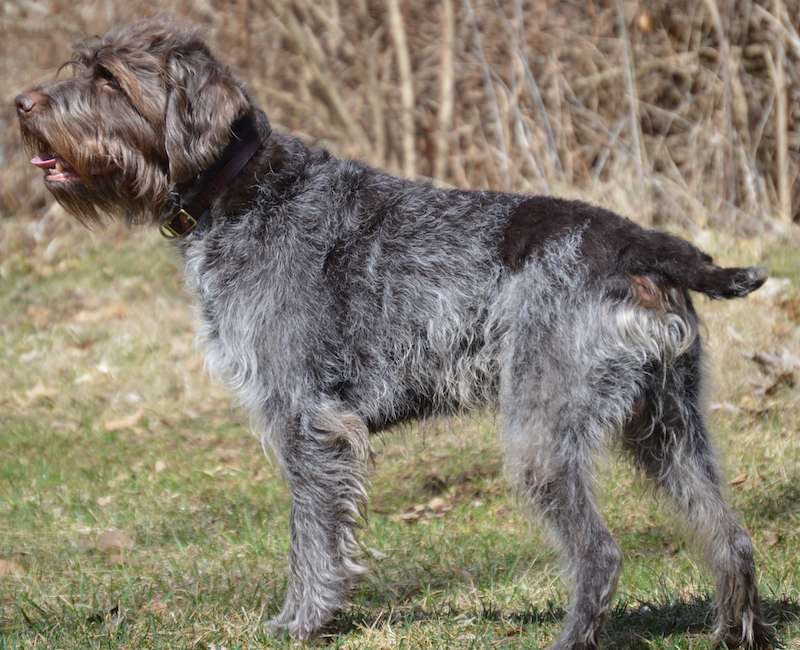 Gait: The Wirehaired Pointing Griffon should cover ground in an efficient, tireless manner. He is a medium speed dog with perfect coordination between front and rear legs. At a trot, both front and rear legs to converge toward the centre line of gravity. He shows good extension both front and rear. When he is moving, the topline is firm and level. A smooth, powerful ground-covering ability can be seen. Fault: Any deviation from the above description must be considered as a fault and should be penalized to the extent of its seriousness. ; Tri-colour is a serious fault. ; light eyes ; Short coat except on the head when the skull, ears and cheeks are groomed French style. The eyebrows and moustache must however, be prominent. ; Missing teeth: more than two incisors, or more than two PM1, more than one PM2, PM3, PM4 or a missing molar. ; Aggressiveness towards people; excessive fear. ; Lack of type. Disqualification: Black coat and/or nose colour ; Overshot, undershot or wry mouth ; Ectropion, entropion, wall-eyed ; Tailless, short tail ; Monorchid, cryptorchid ; Absence of undercoat.